On the list of things I would never have guessed I’d be playing on my iPhone in 2014, a rhythm game from SNK based on the King of Fighters franchise has to rank pretty highly. I’m not going to question what led SNK to make their first new music game in over 13 years, but given how fondly I remember their last one, I’m glad to see them return to the genre, even if it’s in quite a different form. 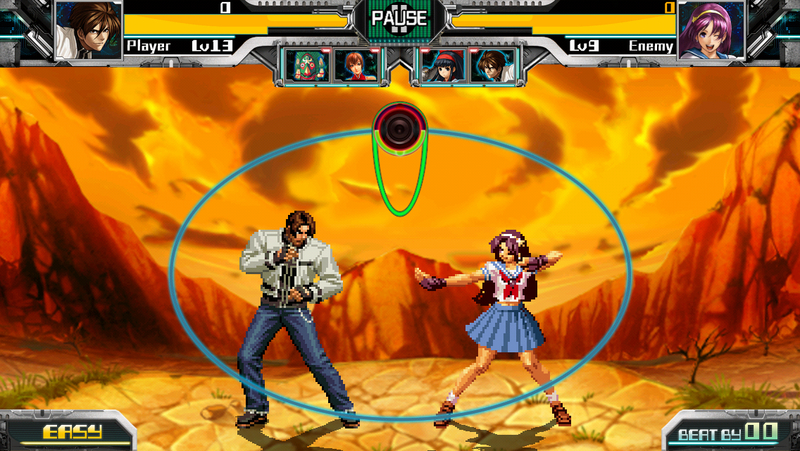 I’m going to go out on a limb and guess that most people haven’t played SNK’s Cool Cool Toon for the SEGA Dreamcast, given it was a fairly late Japan-only release, but if you have, The Rhythm of Fighters (Free) borrows heavily from it, along with a little inspiration from Theatrhythm Final Fantasy (Free). 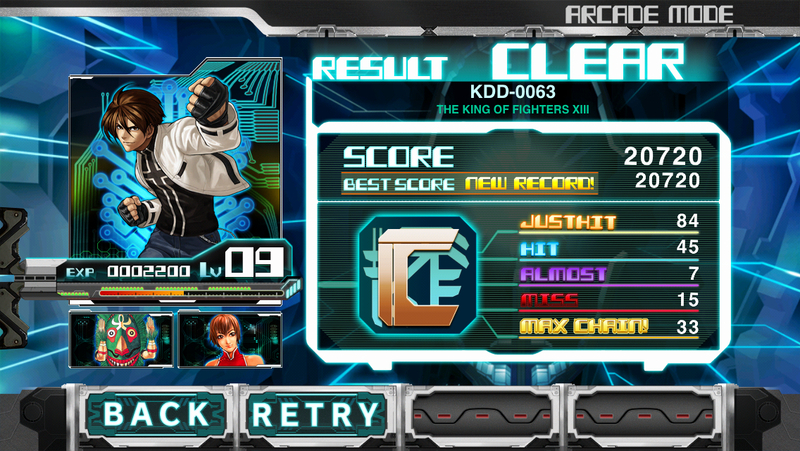 The base game includes 14 songs from various SNK games set up in 10 progressively harder courses. Each course consists of five songs, which you play one at a time, trying to meet the requirements to clear each stage. In the early courses, you just have to survive until the end of the song, but later courses will introduce more difficult challenges such as hitting a certain number of perfect notes. A circle in the middle of the screen will show prompts that you need to tap along to with the right timing. Some of them are simple taps, some require you to flick in a direction, and others require you to hold the note. Depending on your timing, you’ll get a certain number of points, but more importantly, the fight happening in the background will be affected. If you hit the beats well without any mistakes, your character will thrash on his enemy. If you make a mistake, you’ll be on the defensive, and if you make too many, your opponent will start beating on you, depleting your life bar. You’ll fail the stage if that life bar is completely emptied before the song is finished, while if your opponent’s bar is emptied, a new fighter jumps in and starts battling. You get extra points based on how many you take out, and some of the later stages require you to beat a certain number of opponents before the song is up. The background graphics are mostly reused from their respective games, though there’s at least one background representing Cool Cool Toon that must be new, unless I’ve missed something somewhere. As you play through, you’ll earn experience points that will level up your stats and improve both your chances of surviving and your ability to take out your opponents. You’ll also unlock a variety of goodies. Most of the time, you’ll unlock a support character from another SNK game. You can equip up to two of them at one time, and each one has their own special power to help you out. You’ll also occasionally unlock things like new sound effects and new versions of the songs to play in free play mode. There are some great cameos among the support characters, but since they’re not much more than a small picture, I suppose it’s easy to put just about anyone in this way. 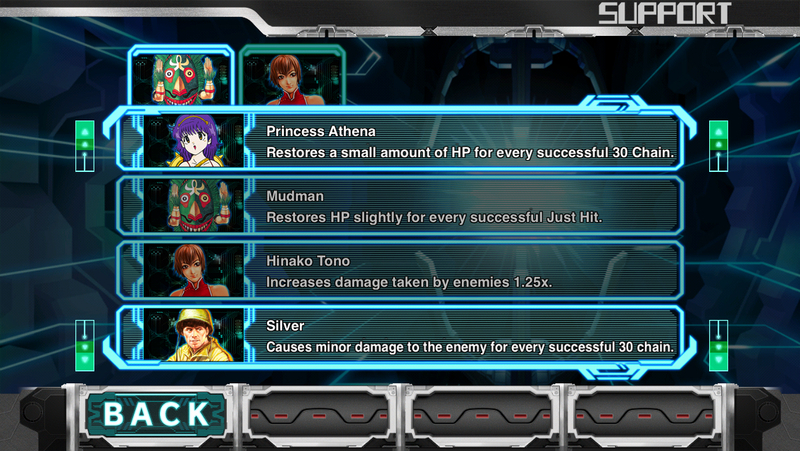 Nevertheless, it’s nice to see SNK acknowledge its wider history beyond King of Fighters and Metal Slug. The free play mode is also where you can play any of the songs you can buy via IAP, so this is as good a time as any to talk about what the game is selling in terms of extras. First and foremost, the game sells packs of songs for $2.99. These are themed around particular games, and each one contains four songs with all difficulty levels unlocked. There are also packs of support characters available, with three to each pack. Most of these cost $0.99, with the exception of a special pack for $1.99 that includes characters that will completely break the game. Finally, you can also buy extra playable characters for $2.99 each. The base game allows you to choose from Kyo, Athena, and Ryo, but if you want to use Iori, Terry, or Nakoruru, you’ll have to buy them. Every character has a few unique traits, and the experience and levels you’ve earned carries across to each of them. I feel like the base game gives you quite a lot for its asking price. The song packs are fairly reasonable compared to other music games, so I don’t have much of a problem with these, either. I picked up the Metal Slug 2 pack, and it was definitely worth it. The support characters seem a bit expensive unless you want to cheat your way through the game, and the extra playable characters are kind of ridiculously priced, particularly considering they’re simply reusing existing sprites. They’ve put two of the most popular characters in the franchise behind the paywall, which is clever but not very nice. At the core, the music is the most important thing, so I’m happy that it’s not quite as expensive as some other music games I could name, but I’m also here for the fanservice, and that part feels less friendly. Finally, there’s the matter of lag. While I haven’t experienced much of it all myself on my iPhone 5S, I’d be remiss if I failed to mention that a couple of people in our forums are reporting timing issues. I can’t verify these myself, but I have noticed that there’s sometimes a brief pause when characters are jumping in and out from doing super attacks, which throws me off a little. The game says it needs an iPhone 4S or higher to run, and it could be that there are problems with hardware configurations near the lower end of that requirement. Also, please take note that this is an iPhone app, not a Universal one, so if you’re flying with an iPad exclusively, you might not get an ideal experience. It’s not the most high-effort product, and the initial buy-in only gets you about half the content, but I still had a really good time with The Rhythm of Fighters. The gameplay, at least on my device, was smooth and fun, the music selection is well-suited for this kind of beat-heavy game, the difficulty curve was just about perfect, and the amount of content for the initial price is a lot better than what I’m used to getting in this style of game. I would love to see SNK build on this further in the future, but even in its present form, I think this is a pretty solid pick-up for longtime fans of the company. Those with no special affection for the company can probably find better choices on the App Store in terms of music games, however.